A collaborative, team-based, principles driven, planning process. Through the wraparound process, teams create one individualized plan of care to meet the needs—and improve the lives—of multi-system involved youth and their families.
) 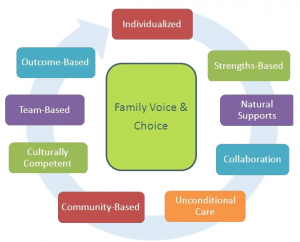 Family-Driven and Youth-Guided (NWI: Family Voice and Choice): The family and youth, and their needs, direct the types and mix of services received.
) Strengths-Based: The strengths of the youth and family are assessed and considered pathways to resolve needs and concerns.
) Natural Supports: The team consists of more natural and informal supports than formal service providers. Natural supports are continuously encouraged and supported.
) Individualized: The services and supports are provided based on the needs and strengths of the family, not agency function, menus of services and milieu.
) 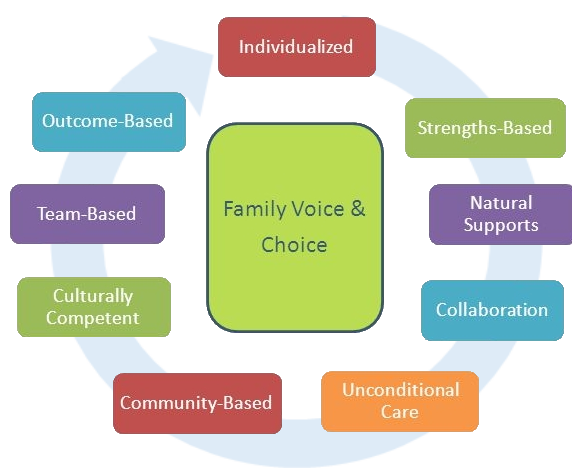 Culturally and Linguistically Responsive (NWI: Culturally Competent): Supports and services build on the preferences, attitudes, beliefs and culture of the family and youth.
) Team-Based: All decision are made by the team, not individuals. Families are actively involved in all decisions.
) Community-Based: The supports and services provided mirror that of the community of the family and youth. Every effort is taken to keep the youth in their community.
) Collaboration: All plans are co-authored by the team and family. All decisions are made at the team level.
) Persistence: Specific behaviors do not expel a family from the process. The created plan fails, not the family. Plans are revised at least every 30 days.
) Outcome-based: All supports and services should be based on what works. Each Wraparound plan (and the project) should be linked to observable and measurable indicators of success.